After a long wait amid considerable rumors, on Sept. 9 Apple announced the new iPhone 6 and its first-ever phablet, the iPhone 6 Plus. Mashable reports that the iPhone 6 will have a 4.7-inch screen and the Plus will have a 5.5-inch screen. They both will have the same internal specs, but the Plus will have a higher resolution of 1920 x 1080. The iPhone 6 came out Sept. 19 for $199, $299 or $399, depending on the amount of GB, which is great for any of us hanging onto our carrier's upgrade renewal. But, for late purchasers of the iPhone 5S or 5C, there isn't much hope for a new iPhone 6 on launch day, unless you're willing to pay the hefty non-subsidized price. For all those living in contractual limbo: Don't fret. Sure, maybe you can't have the iPhone 6 with the rest of the Apple fanatics on day one, but you can take a few tips and tricks to keep your current iPhone kicking until your next upgrade. If your phone is slow or unresponsive, there's a good chance nothing is wrong with the hardware. Think about all the pictures, emails, texts and apps that build up on your phone over the months. Even a device as new as the iPhone 5 can get bogged down by an overabundance of content (and let's face it, do you really need all those pictures of your cat in that weird Christmas sweater?). Take a leap of faith and wipe that phone clean. It's time for your phone to look and act like it came right out of the box. Of course, save your important pictures and emails to your desktop first. And don't worry about your paid apps, because they are 100 percent re-downloadable for free. Follow these step-by-step instructions from Apple's support forum (but don't restore your iCloud backupâ€”remember, this is all about new beginnings). Now that your phone is fresh on the inside, it's time for a fresh look on the outside with a new case and screen protector. The best thing about iPhone cases is there are thousands of designs to choose from. Some are just plain protective shells, and others double as wallets or battery packs. 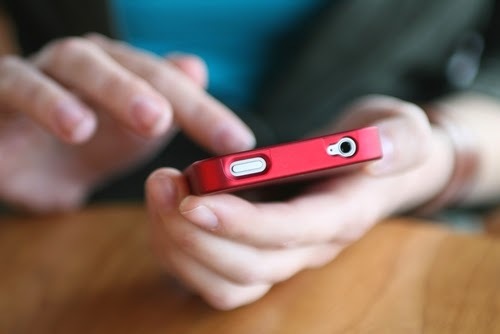 Think about getting a matte screen protector, too, as they reduce glare and hide fingerprints. Clean on the inside, clean on the outsideâ€”your old iPhone isn't looking so old anymore. But remember, it still needs to last until your next upgrade. There are a couple final details to ensure your phone will go the distance. First, get yourself a protection plan in case your iPhone decides to take a fall. Even the best cases can only do so much to protect against cracked screens and water damage, and just the right angle can destroy any phone. Protection plans are typically about six dollars a month and ensure you don't pay full price for a replacement. The second method is to purchase a decent cleaning kit to keep all the dirt and grime off your phone. iKlear makes a decent kit and will give your phone that polished look you see in the Apple Store. After that, just ride out the contract wave with your "new" phone, and the iPhone 6 will be in your hands in no time. I work remotely for my day job and have been doing that for a little over a year now. It's pretty great and generally gives me some flexibility. My company benefits from it too because I am always at the office and ready to jump on an issue at a moments notice. One of the very few issues I have with working remotely is that my laptop is still controlled by Group Policy, and one of the policies I have in place is to lock workstations with ten minutes of inactivity for security purposes. This sort of thing is very important in an office environment where there are a number of people that could potentially access your computer if you step away and forget to lock it. I'm at home though, and the only other creature with me during working hours is my dog. She's pretty smart, but lacks the opposable thumbs to hack anything off of my company laptop. Because of that fact, I feel that my laptop is pretty secure if I step away without locking it all the time. The problem is that I can't disable that on my laptop. It is a light app, so you don't have to install it to use it. Just download it and double click it to start. You can set your options and just leave it in your system tray. 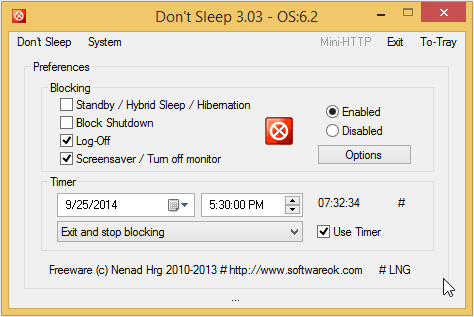 I have mine set on a timer during working hours so it automatically closes and my computer can lock and turn off the monitors at the end of the day on it's own. During the day though, my computer keeps me logged in and unlocked so if I have to run to the kitchen or anything else longer than ten minutes I don't have to worry about logging back in when I return. Do you have something like this running that essentially does the same thing? Is it free? Let us know in the comments. A new baby, new joy, new worries. After the little one comes, there is oh, so much happiness. With that happiness comes oh, so many worries. Is the baby sleeping okay? Has she had enough to eat? Does he need to be changed? Does she have a fever? Thankfully technology has really come through for parents of new babies. Here are a few gadgets you can use that are really convenient and might help you not worry quite as much. The absolutely perfect reason for a baby to have a pacifier. Pacifier Thermometer is a gadget that takes a baby’s temperature without disturbing her. Its Fever Alert function glows and allows parents to read her temperature at night without waking the baby up. It comes with a protective cover for the diaper bag. Babies love to be swaddled, and now we have smart swaddling. Babies don't come with instructions, but SwaddleDesigns blankets do! 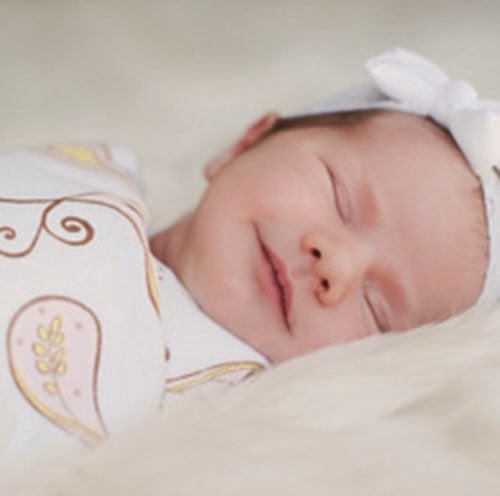 SwaddleDesigns has come out with a smart swaddling blanket with swaddling instructions sewn to the blanket and a scannable QR code on a label that makes it super easy to use on your smartphone. Help is there when you need it. By scanning that code with the QR reader in your smartphone, you have access to short instructional videos such as, how to swaddle a baby, newborn care tips, and free white noise to help calm baby. When babies cry, swaddling can help to calm them. The smart swaddling blanket will help you learn to swaddle, and the full-length white noise are proven to help calm and relax baby. Babies sleep better and longer when swaddled, especially with the addition of white noise, which means parents get more sleep, too. Baby monitors have come a long way. Standard baby monitors come with video now. There are smart monitors that will allow you to turn on the nightlight in your baby’s room or play music, all from your smartphone. Automatic night vision: You can see the baby clearly at all times of the night. Audio-triggered video recording: When the baby starts to cry, the monitor automatically starts recording the baby so you can see why she started to cry. Multi-camera monitoring: Yes, one camera is enough, but imagine being able to monitor not just the baby, but your toddler’s room and the front door. It can accommodate up to four cameras. Each monitor starts you out with one. Two-way audio: Instead of the standard one-way-you-can-hear-the-baby-crying monitor, this feature lets your baby hear you. If you want to sing to her or just tell her you’re on your way, the sound of your voice will be a comfort. Video recording: This is not a baby monitor standard, but you can get Lorex to add motion-activated wireless video cam surveillance (told you it was CIA-like) for your baby monitor as part of the system. The technological gadgets that have been designed for new babies and their parents are incredibly helpful to a parent with a new baby. By providing brilliant tech baby aids, manufacturers have made it possible for you to know that your baby is safe, warm, comfortable, well-fed, and healthy so that you can maybe worry just a teensy bit less. 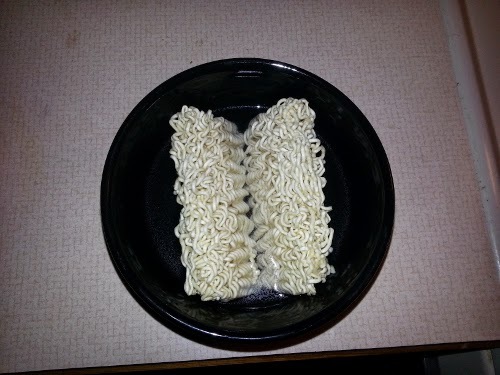 In a regular sized bowl, break the noodle brick in half and place the two halves sideways in the bowl so they can fit, then fill the bowl about half way with water. Place the bowl in the microwave and microwave it on high for two minutes. Take out the bowl and stir in the remaining noodles, then place the bowl back in the microwave and nuke them for another two minutes. Take the bowl out of the microwave and stir in your flavor packet. Bam! 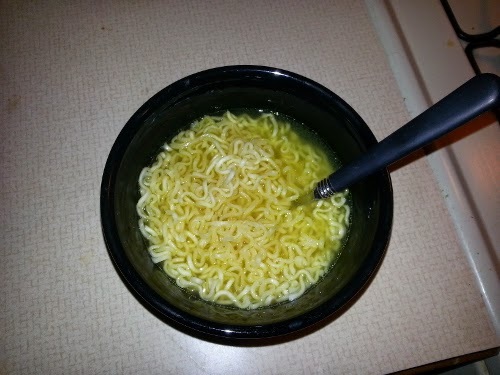 Microwaved Top Ramen! There you have it, my super secret microwave Top Ramen recipe. Do you do it differently? I'm curious to know how you do it. Let us know in the comments. 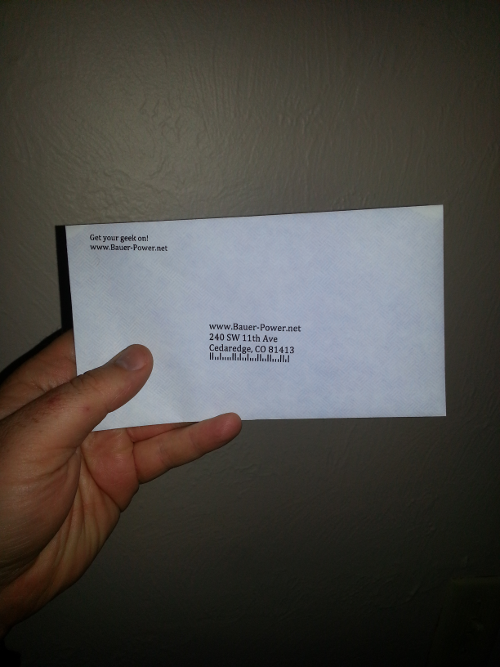 For years I've used Microsoft Word to prepare envelopes for mailing. It is pretty easy to do, and generally gives your letters a little more of a professional polish than handwriting addresses, or even using rubber stamps. 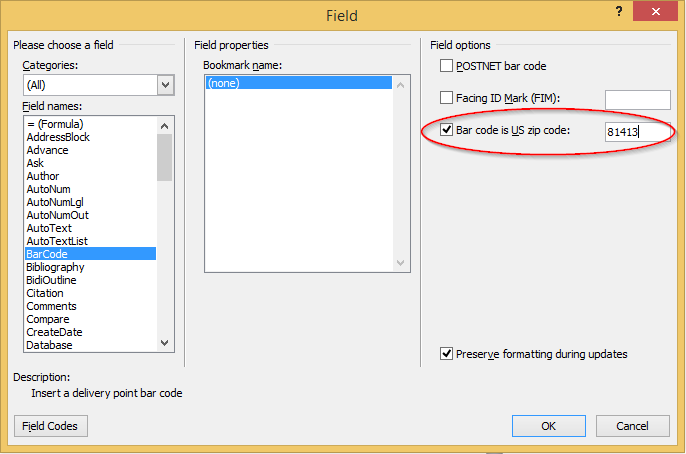 Before Office 2007, you used to be able to type in an address and easily add a POSTNET barcode to your labels, but according to Microsoft's KB897290 that codes is now obsolete, and so they stopped including it in the Microsoft Office Suite. This doesn't mean you can't still do add it, it just means you need to do it slightly differently. The following was tested in Microsoft Office 2010, and I'm sure the process is similar in Microsoft Office2013 (If it isn't, let us know in the comments). 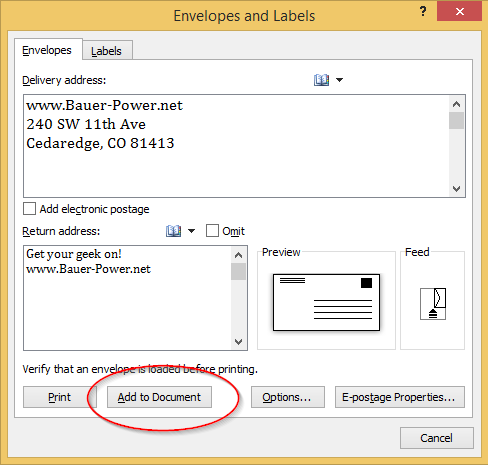 In Microsoft Word go to Mailings > Envelopes and enter your delivery and return addresses like usual, then click Add to Document. Select BarCode and check the Bar code is US zip code check box, then enter in the delivery zip code then click OK.
A new barcode will now be shown beneath your delivery address, and you can print like usual. Here is a picture of mine, of course it looks jacked up because my printer's envelope feed is poorly designed, but what can you do right? Did this help you out in your mailing tasks? Let us know in the comments! Barcode printing buyer's guide: which one is right for your business? The other day I had to send a letter out and I wanted to include another PDF along with my letter. I wanted to combine both documents into one single PDF. The trouble was that the PDF I wanted to include had a security restriction preventing it from being printed for some reason. I needed that restriction removed if I was going to combine both documents into one easy to use PDF. Well I found a simple website that will remove the restriction for you. It will also remove any passwords on PDF's if they have one. It's called PDFUnlock! To remove the restriction I uploaded the original, and after only a few seconds a pop-up to download the unlocked version was ready to go! After downloading the original version I was able to combine the documents like I needed to! After combining the two I was able to add my own restriction to prevent if from printing (Although you can see it is almost pointless) so we were back to the same level of "security" we had before. Have you used a tool like this to unlock or remove PDF passwords? If so, what did you use? Did it cost money? Was it free? Let us know in the comments! So I mentioned the other day that I thought Amazon's new CPM advertising network was the best Adsense alternative yet, and I wanted to give an update on that with some numbers you could see and compare them to Technorati Ads which I had thought was the best up until now. Now it certainly wasn't what I was making with Adsense, but it is starting to get pretty close. I've only had Amazon CPM for less than a month now and already the daily average is getting close to what I used to see with Adsense when I first started using it. My traffic has also declined a lot since my Adsense days because since I wasn't making that much from the blog anymore, I stopped blogging as much. Since I'm not blogging that much, that means less fresh content and that means less traffic. It may be a bit hard to read, but I didn't even make $8.00 from Technorati, and my CPM was only $0.17. Pretty pathetic right? Amazon is clearly the winner in the advertising revenue department when you are looking for an Adsense Alternative! I have had the opportunity to chat with the Amazon CPM team since this is a new product they have and they wanted my feedback. I let them know that having more ad sizes would be nice so you can put them in more places on a website. What do you think so far? Are you going to give Amazon CPM a shot? Let us know in the comments! Best Money Making Adsense Alternative Yet! Our New Project: Survival and the great outdoors! 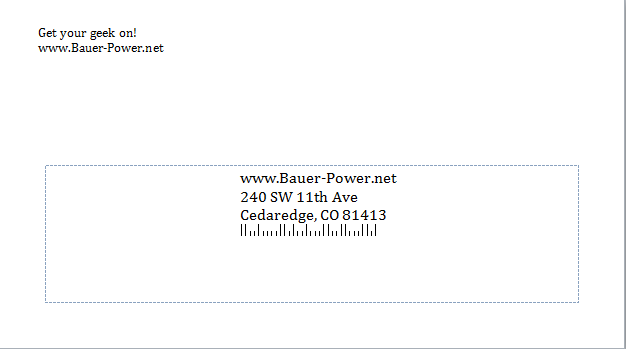 I know I don't post a heck of a lot to Bauer-Power these days. I guess my focus has been in other places. I did want to take this opportunity to introduce you to one of my new projects though and it has nothing to do with technology or software! It's a new weekly blog called Bauer vs Wild where I write about survival primarily, but I also talk about hiking, camping and other general outdoor activities including geocaching! If you didn't know, I grew up in the mountains of Colorado and spent a great deal of my childhood exploring the woods by my house. Getting into the outdoors is something that is near and dear to my heart. I also really like the idea of living off the land, and roughing it in the outdoors and that is what this blog is all about. If you are into wilderness survival, hiking, camping or other outdoor activities where you may get caught in a survival situation, then check Bauer vs Wild out. There will be new posts every Monday! I recently added some new Windows Server 2012 R2 servers to my environment for a project I'm working on. So far I really like this operating system, and I'm getting used to where everything is. 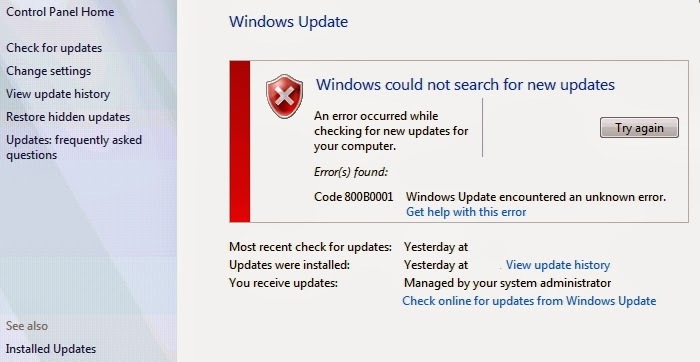 That being said, I have ran into a few issues and one of them is an error I've been getting when trying to update these servers from my Windows 2008 R2 WSUS server. The issue should be fixed now. If you have a lot of servers/workstations with this issue you might want to run those commands as a part of a start up script. Did this fix your issue? Let us know in the comments!